CLAIM / Video: A Syrian man attacked Atatürk statue in Adıyaman. 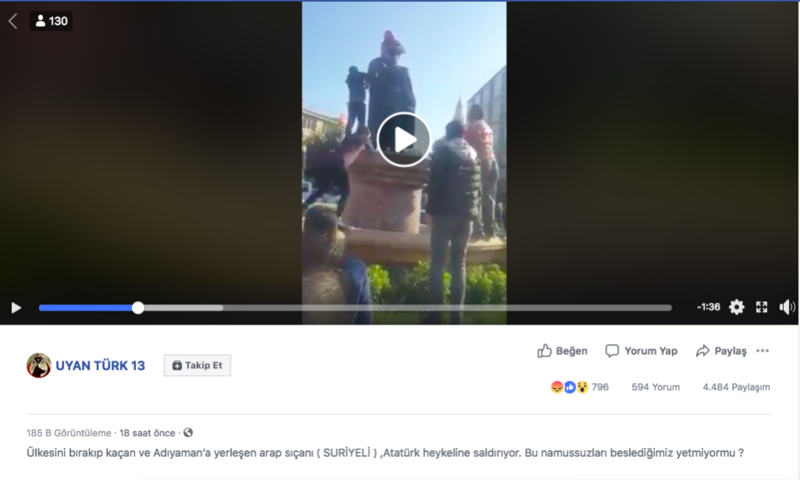 It was claimed that a video which was shared on social media and sent to teyit.org as a notice shows a Syrian refugee attacking Atatürk statue in Adıyaman. 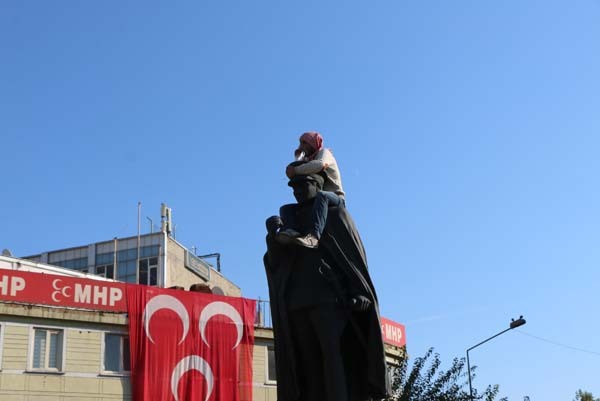 In the video, a man asserted to be Syrian climbs on Atatürk statue located in Kapcami Neighborhood Sümer Square and sits on shoulders of the statue. 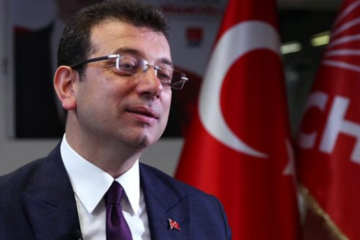 Barış Yarkadaş, İstanbul Deputy of the Republican People’s Party (CHP), stated that the video of the so-called Syrian refugee was sent to him by the head of CHP bureau in Adıyaman central district. Yarkadaş shared it on Twitter and the video was viewed by 333,000 users. Later, the video was shared on various pages on Facebook as well. Up to now, approximately 190,000 people viewed the video which was shared on Facebook on November 13, 2018 on a page called “Uyan Türk.” Besides, it was shared by 5,000 users. The man climbing on Atatürk statue is a Turkish citizen named Ahmet B. However, the claim that a Syrian man attacked the Atatürk statue in Adıyaman is not true. The person climbing on the statue in Sümer Square is a Turkish citizen named Ahmet B. 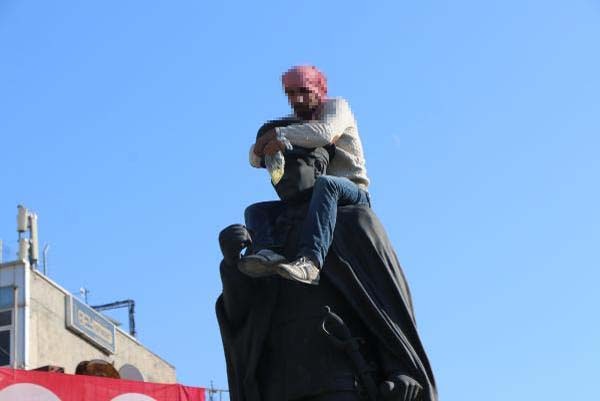 Intervention of the police and citizens in the person sitting on the shoulders of Atatürk statue can be seen in the footage shot by Demirören News Agency (DHA) on November 13, 2018. It can be observed in the images that the man does not want to climb down Atatürk statue. A bag in his hand draws attention as well. 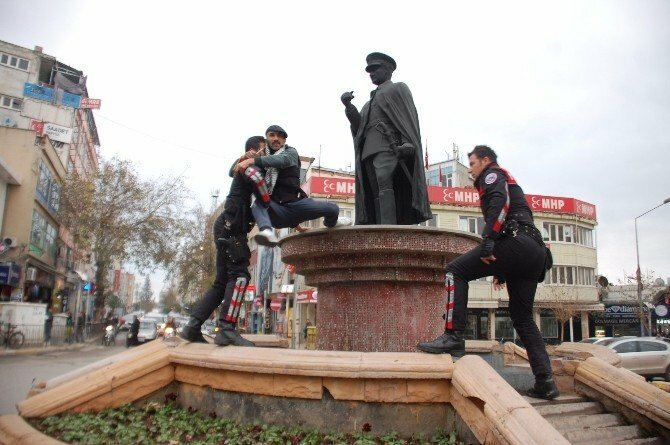 On the other hand, Milliyet reported that a drug addicted citizen named Ahmet B. climbed on Atatürk Statue in Adıyaman, and he was saved from lynch of those around by the police. Another news article published on Hürriyet on November 14, 2018 provided information about the event taking place in Adıyaman. It is mentioned in the news that Ahmet B. who climbed on the statue and was saved from lynch at the last moment is a bicycle mechanic. According to the statement he gave to police, his admiration for Atatürk encouraged him to climb there. In another footage taken by a different user, it can be understood that the person on Atatürk statue was using drugs. 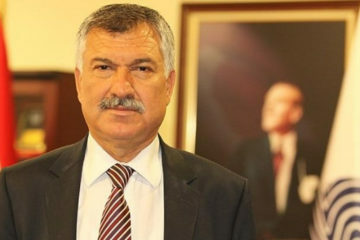 teyit.org placed a call to Adıyaman Security Directorate Public Security Branch office and learnt that the man saved from lynch is a drug addicted Turkish citizen. 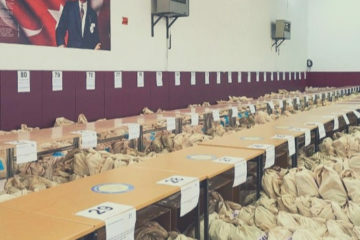 In another phone call of teyit.org with CHP Adıyaman Provincial Directorate which was referred by Barış Yarkadaş, it was confirmed once again that the person in question was Turkish, contrary to what was claimed. 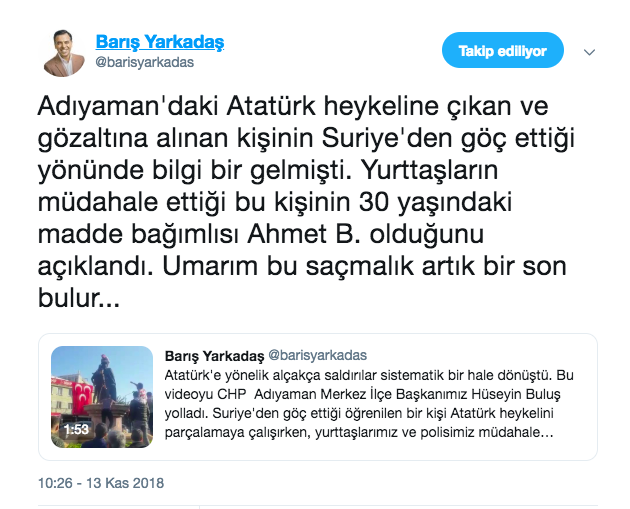 Barış Yarkadaş explained in his following tweet that his earlier tweet about the Syrian man on Atatürk statue was based on the information they received before. He added that the detainee whose name is Ahmet B. is actually a drug addict aged 30. It is understood after a web search that Ahmet B. did the same act on Atatürk statue in Adıyaman before. 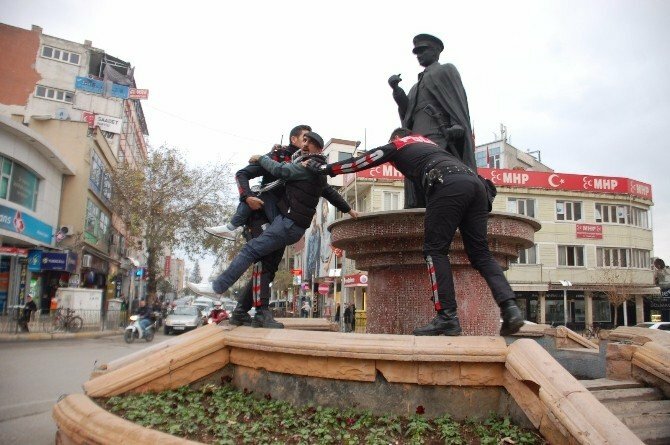 According to the news article of Milliyet dated December 24, 2016, Ahmet B. climbed on the same statue and shouted “Martyrs are immortal, our land is indivisible”, and then the police intervened. The photos taken in the place of incident demonstrate that the suspect is the same person.